Product names: aluminium profile wood grain transfer machine, aluminium profile wood grain transfering machine, aluminum profile wood grain vacuum transfer machine, wood grain vacuum transfer machine, aluminum profile wood grain transfer machine, aluminium section wood grain transfer machine, vacuum transfer machine, wood grain transfer machine, aluminium profile wood grain covering machine. Wood grain transfer machine is used for decorating the profile surface. This aluminium profile wood grain transfer machine adopts single pumped bag, which improves transferring process of complicated and difficult profiles, improving output greatly at the same time and reducing consumption of wood paper. Wood paper is divided into strips, the size of this the area which aluminum profiles needed. 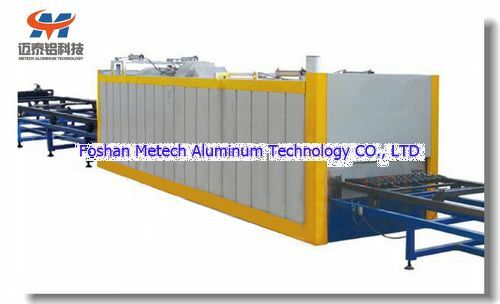 The surface of aluminum profiles is packaged by wood paper simply, then putting the aluminum profiles into bag film, the head of bag film is tied and the other head is connected with vacuum tap, then pumping vacuum which makes wood paper is closed to the surface of profiles, then entering into furnace, heated, transferred, solidified afterwards, it will exit automatically at the suitable time. You will see clear simulation wood grain after removing waste paper. Copyright © 2016 Foshan Metech Aluminum Technology Co., Ltd. All Rights Reserved.